“The town people [of Nagasaki] were out in holiday attire to take the air and look out on the bay and stare at the General. After we had made our tour of the fairgrounds the Governor asked General and Mrs. Grant to plant memorial trees. 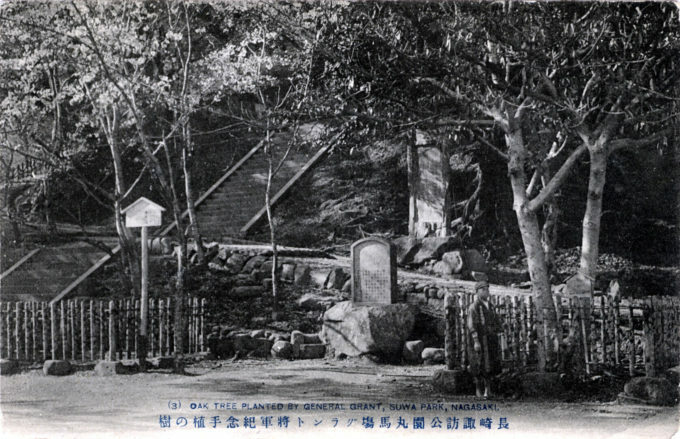 General Grant Tree and memorial stone, Nagasaki, c. 1910. “Nagasaki (AP) – Today we have bad news for General Grant. Some scalwags cut down his old banyan. “They not only cut it down – they piled the site high with stone and rubble … Twings, leaves, trunk and memorial tablet all vanished – the Grant banyan is gone, a casualty of the second world war. From the wiki: “After leaving the White House, General Ulysses S. Grant embarked on a world tour. Grant’s tour was initially planned as a private affair with no set duration but grew to assume diplomatic proportions when the Rutherford B. Hayes administration, aware of Grant’s popularity in Europe, encouraged him to extend his tour and voyage around the world to strengthen American interests abroad, an unprecedented undertaking for a former President. The Grants dined with Queen Victoria at Windsor Castle, and Grant gave several speeches in London. “After a tour on the continent, including Switzerland, the Grants visited Scotland, afterward spending time with their daughter Nellie, who had married an Englishman and lived in Southhampton. Grant and his wife then journeyed to Paris and Italy, spending Christmas 1877 aboard USS Vandalia, a warship docked in Palermo. After cruising the Mediterranean, the Grants took a winter sojourn through Egypt and the Holy Land followed by a visit to Greece, before returning to Italy and a meeting with Pope Leo XIII. In 1878, they toured the Netherlands before moving on to Germany. “In Russia, Czar Alexander II talked to Grant about the future of the Plains Indians. After touring Spain and revisiting Paris, the Grants returned to England. From England, the Grants left by private ship, sailing into the Mediterranean and stopping at Marseilles, then across to Alexandria visiting Egypt hurriedly and on through the Suez Canal to India. They visited cities throughout the Raj, welcomed by colonial officials. “After India, they toured Burma, Siam (where Grant met with King Chulalongkorn), Singapore, and Cochinchina (Vietnam). Leaving Hong Kong, the Grants visited Canton, Shanghai, and Peking, China, where he criticized the autocratic attitude of Westerners toward the Chinese, which he compared to that of antebellum slave owners … [C]rossing over to Japan on the USS Richmond, Grant met the Emperor Meiji.